When I first moved to Georgia from California, finding “local wine country” had not even occurred to me. A day trip to Northern Georgia revealed not only a beautiful region of Georgia, the beginning of the Appalachian Mountain range but also, rows and rows of vineyards. We stopped in at a winery called Frogtown Cellars. I knew I was in Georgia when we were greeted by two blood hood dogs sleeping in the vineyard (remembering back to a California winery visit when two standard poodles came out to greet us). 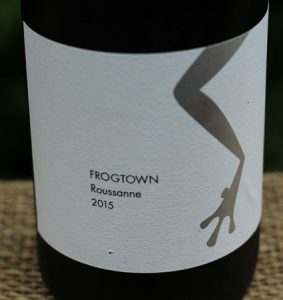 Frogtown Winery was established in 1998 by Atlantans Craig and Cydney Kritzer. 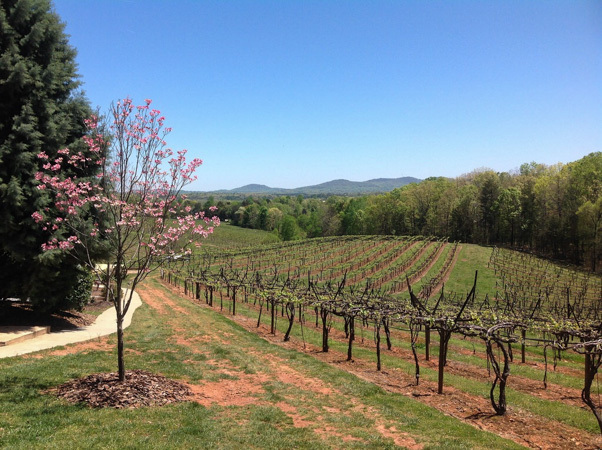 The estate is located between Dahlonega and Cleveland, Georgia in the Frogtown District of Lumpkin County and is geographically in the “Dahlonega Plateau” recently recognized as an American Viticulture Area (AVA). The estate includes 44 acres of vineyards with 18 different grape varieties including; Cabernet Franc, Cabernet Sauvignon, Chardonnay, Marsanne, Merlot, Norton, Petit Verdot, Picpoul, Roussanne, Sangiovese, Sauvignon Blanc, Seyval, Tannat, Vidal, and Viognier. After a wine tasting with the owner, I signed up to become a citizen of the winery (wine club member). Visiting the Northern Georgia wine country and Frogtown Winery I knew I needed to make regular visits to stay connected to “wine country,” whether it was in California or Georgia. I now visit quarterly savoring the change of seasons in the vineyard, tasting the new releases, and picking up my wine club allocation. Lemon in color. Low+ acidity and medium body. Notes of lime zest, pear and white pepper. Medium dark ruby in color. Medium acidity, body, and tannins. 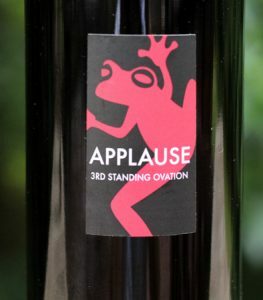 Notes of black & red fruit and vanilla. When I moved to Georgia, adjusting to a new wine country also meant a shift in cuisine. The Southern drill includes barbecue, fried chicken, macaroni and cheese, AND PIMIENTO CHEESE, PEACHES, NORTH GEORGIA TROUT, and of course lots more. 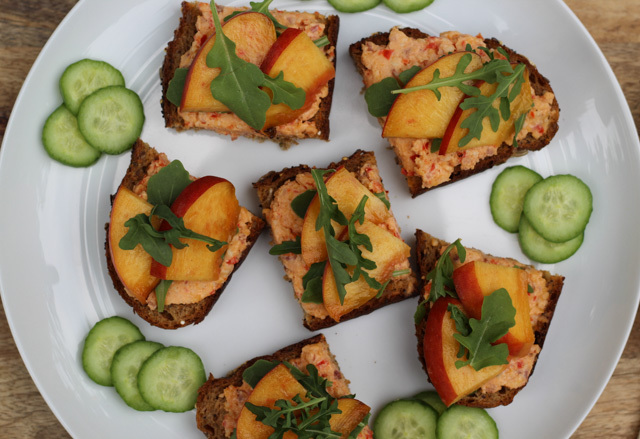 I had not been much of a pimiento cheese person until I tried Pimiento Cheese and Peach Toasts from Todd Richards new cookbook “Soul.” Also from his cookbook is a simple recipe for pan-fried trout. 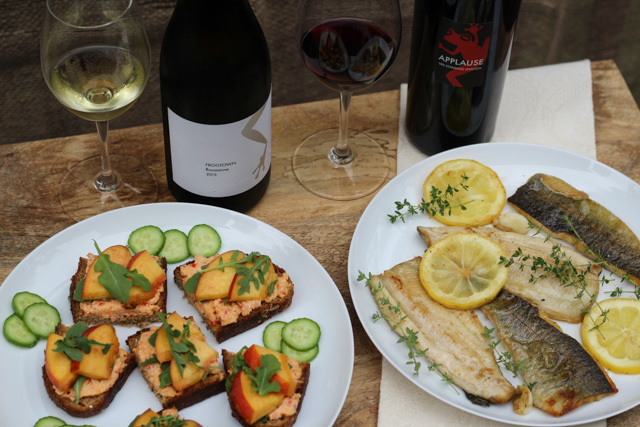 Both of these tasty southern bites were a superb pairing with the Frogtown Roussanne, and the pimiento cheese and peach toasts were spot on with the Frogtown Applause. So when you come to Georgia, go north, visit Frogtown Winey, and drink some Frogtown wines with a view of the Appalachian mountain range. Preheat oven to 400F. On a baking sheet lined with foil, bake the bacon for 10-15 minutes or until crisp. Remove from baking sheet onto a plate lined with paper towels. Set aside to cool. When cool, chop bacon into small pieces. 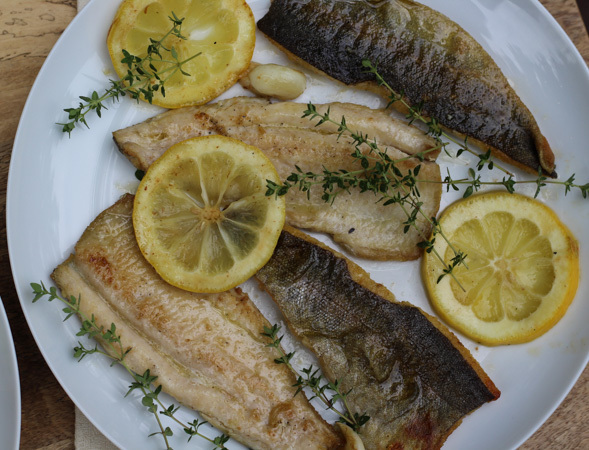 In a medium frying pan, add olive oil. Sauté red pepper for about 2 minutes. Add the adobo sauce and continue to cook for 1-2 minutes. Remove from the heat. Stir in the bacon, mayonnaise, vinegar, dry mustard, granulated garlic, and black pepper. Transfer mixture to a food processor and add Cheddar cheeses and cream cheese. Pulse on/off until mixture is combined. Transfer to a bowl and use immediately or refrigerate until ready to assemble the toasts. Toast the bread to a medium toast. Spread with pimiento cheese. Cut bread slice into thirds. Top each third with a peach slice and a few arugula leaves. Lori of Dracaena Wine talks about how “Bi-coastal Life Gets Confusing.. Thank Goodness for Wine”. Jill of L’Occasion is talking about “Midwestern Gardens and Missouri Wine: America’s First AVA”. And here at A Day in the Life on the Farm we are “Chilling Out with Green Barn Winery”. You are welcome any time In Georgia, fall is my favorite season here. Okay, I’m convinced. Time to make pimento cheese! Let me know what you think of pimiento cheese! “the Frogtown District of Lumpkin County” — sounds like a great novel! I’m impressed with all the varieties they grow there. I bet it is beautiful! And I think you should write that novel! You know when you find something new to you and enjoy it, all of a sudden you are more aware of it. I had met a friend in Napa for lunch. We went to a restaurant that pretty much only served “toast” I was at first taken aback and was like WTH? But I ordered tomato toast and it was like I found a new heaven!! Since then (which was only Tuesday) I have seen reference to so many types of “toast” I wonder how I never saw these before. BTW- also have never had pimento cheese. guess I need to try this too! Funny how the universe works, never had “toasts’ before and then you realize “toast” is everywhere! LOL If you never had pimiento cheese, I do think this one is a winner and a few sliced peaches don’t hurt either. Cheers!